The packaging is in green which makes you think of a natural approach to clearing out fungus problems. The package also shows nails afflicted with the fungus. It shows how bad fungal infection can be and that Fungi Cure is the solution for that. It strongly upholds the statement of a fast application and treatment of fungal infection with no medicinal odor. There is no side effect in using the fungal treatment. The suggested price for the liquid anti-fungal treatment is $12.94. This does not come with any discount prices aside from buying them from registered pharmacies. There is no indication of a money back guarantee. 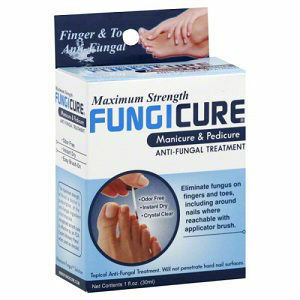 However, the treatment indicated the application on the skin and cuticle area of toes and nails where fungus may reside. It does work on hard surfaced nails as indicated in their label. Alva Amco Maximum Strength FUNGICURE Anti-Fungal Liquid is a clear liquid that utilizes undecylenic acid capable of prohibiting fungal growth in the area. This is recommended for daily use, but its downside is that the treatment does not treat fungus under hard surfaced nails as the application requires that it should applied on the side of the nails and toes areas. The acid only works on the skin directly affected by the fungus and that is only for $12.94 a package. Jack Stevens	reviewed Maximum Strength FUNGICURE	on May 15th	 and gave it a rating of 3.